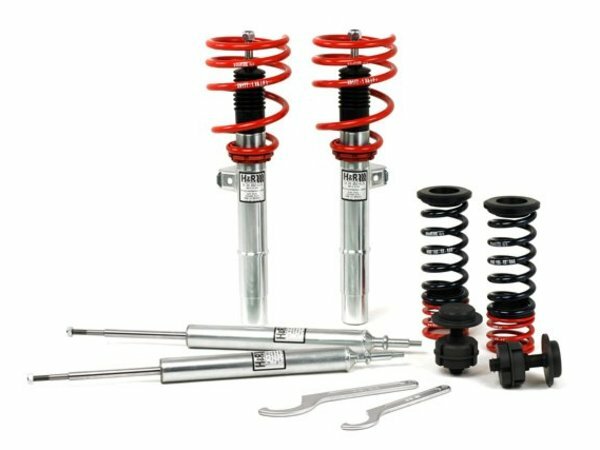 The H&R Street Performance Coilover kit is designed to offer a slightly softer ride than the standard H&R Coil Over kit offered for the E39 M5. H&R combines their progressive-rate springs with specially valved shocks and adds height adjusters that let you set the ride height to your own personal tastes. These coil overs are designed for street use with progressive rate springs that start out soft and stiffen as they are compressed. This helps to keep the ride compliant while still giving better handling and balance. H&R designs each suspension to work as a coil over. This means that the correct amount of travel has been built into each shock. And the shocks are valved specifically for the spring rates to give a tight and controlled ride without being harsh or ultra-stiff. Each H&R coil over is TUV tested and approved and meets ISO quality standards. These are used with the stock strut and shock mounts for a quick and easy install. SPECIAL PRICING FOR A VERY LIMITED TIME!